Joe Dykema directs the defense from the secondary while competing against Augsburg College. Photo courtesy of Christopher Mitchell. 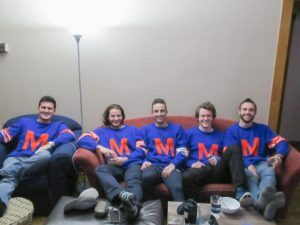 In his four years at Macalester, the senior defensive back has earned a reputation for his ridiculousness, but also his work ethic and dedication. “Joe just brings a combination of intensity, intelligence and fun that you don’t really see with many other people,” said teammate Jole Miller ’15. 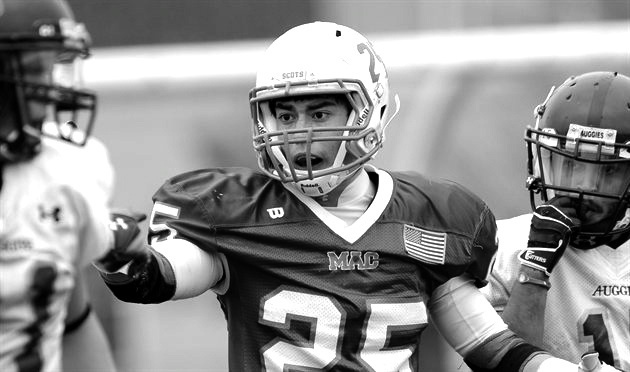 Dykema, an Economics major, was President of the Macalester Investment Group, participated in Macathon, was twice named Defensive MVP of the football team and was elected to the squad’s leadership council. 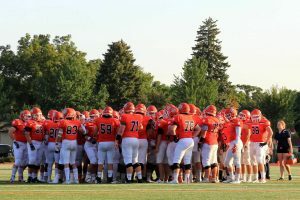 “[He is] everything you’d ever want, in every way, in terms of his leadership outside football, his leadership in the classroom, across campus, how he carries himself, his work ethic, everything he does,” said Macalester Head Football Coach Tony Jennison. Dykema lines up at defensive back during practice. Photo courtesy of Christopher Mitchell. He credits great relationships with professors and classmates for his positive experience studying economics. Dykema’s work ethic and accomplishments have not gone unnoticed. Last week, he was recognized with the Mike McEwen Award, an honor for a student-athlete majoring in Economics who has shown excellence in all disciplines. The award is given in memorial of McEwen ’77, an economics major and guard on the basketball team. The coaching staff of the Macalester Football team has also nominated Dykema for several awards through the National Football Foundation. The organization named him Scholar-Athlete of the Day on Jan. 18 for his exemplary leadership and citizenship in addition to academics and athletics. One of those games came against Hamline during Dykema’s sophomore season. The coaching staff credited him with a key and forceful tackle that sparked the Scots to victory, a win that brought home the Paint Bucket Trophy for the first time in a long while. Dykema at the center of the defensive huddle during a game against Trinity Bible College. Photo courtesy of Christopher Mitchell. Coaches and teammates alike admire his ability to turn on and off his intensity. “He’s a pretty serious guy on the field, but off the field he’s very ridiculous and fun-loving,” Jimenez said. “Probably the thing I’ll miss most are the random segments throughout the day when he’ll bring out that light-hearted sense of humor that you don’t get all the time but that could only come from him,” Jimenez said.